A Few Scraps: How Should I Quilt This? It's a place for showing quilt tops and asking for advice on how to quilt them. And it's a place for seeing beautiful quilt tops and giving suggestions on how they should be quilted. How Should I Quilt This? is a new group on Flickr. Regardless of your quilting style, I'm hoping you'll join. Modern and traditional quilts are welcome. Soliciting advice for any type of quilting is encouraged. Whether you like to finish your quilts by hand or machine, straight line or free motion, I hope you'll be a part of the fun. So who has a quilt they'd like advice on? And who wants to help them out? Me! And you too I hope. Thanks for the link...I will check it out. The hardest part of a quilt is deciding how to quilt it. I agree - fabulous idea! What a great idea! I have some quilts that need opinions! Thanks for the link. I'm a longarm quilter so thanks for the heads-up on this link. Great idea. I'm going over to join right now. What a great idea. I have put a deposit on a Sweet 16, so will be joining soon! I love it! Why hasn't someone thought of this already! I wasted no time in joining. Smart, smart idea! Joined right away! Super idea! 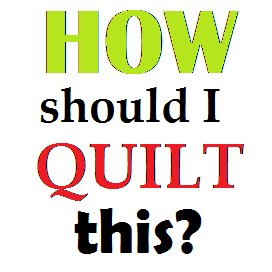 This is awesome, I'm a longarm quilter,and have a problem with deciding what to do. Some have told me sit back and study and the quilt will talk to you, well we aren't speaking the same language,because I haven't heard anything so far. HELLOOOO??? Hi, there. I'm making a QAYG quilt. Now I have to choose a design to quilt. Oh boy...I'm so stuck. I posted my "help " to your suggested group. Sure hope somebody looks at it. I noticed the other discussions were a bit old?